At Last, Coeliacs Get a Pizza the Action! Well come on, I work in the newspaper industry, you’ve got to give me the opportunity for at least one dodgy headline on here haven’t you?! Anyway, if you are coeliac or following a gluten free diet then unless you’ve been living a sheltered life recently then you’ll have witnessed the wave of excitement in the last couple of weeks over three gluten free pizza announcements. First of all Prezzo announced they would be serving gluten free pizza bases, have a look at the comments on this post for some great review comments from Elizabeth and Jessica. This was closely followed by a Coeliac UK announcement that Pizza Hut would be following suit. Just when we thought it couldn’t get any better it was announced the very same day that Domino’s would be serving gluten free pizza from November. There was initially a lot of scepticism amongst the coeliac community as to whether this type of restaurant could really take cross contamination seriously enough to make these pizzas coeliac friendly. However, it seems all three companies have worked closely with Coeliac UK and all have cross contamination controls in place. 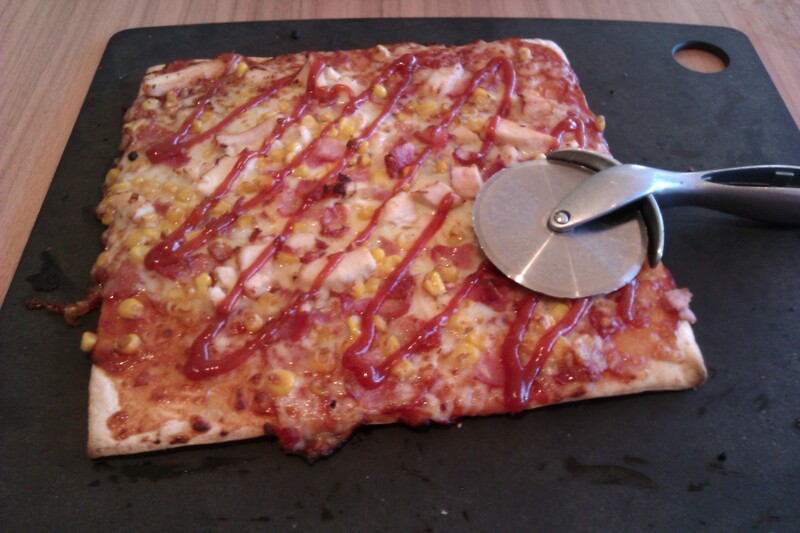 Having looked on enviously at my social media feeds over the last week and seeing picture after picture after delicious looking pizza, I met up with fellow Plymouth gluten free blogger Sarah Ram to try the Pizza Hut offering. Big congratulations to Sarah who passed her driving test just before we met for lunch! I’d rung ahead to make sure the restaurant we were visiting had the gluten free bases, and also downloaded a voucher from Voucher Cloud giving any pizza plus salad for five pounds. I had previously read that the salad bar was a bit of a cross contamination risk, so Sarah and I both avoided that and headed straight for the pizza. Like we were there for the salad anyway! We were told all toppings were gluten free, but being the sceptic that I am I also asked to see the allergy list so we could check our order. We both chose the Americano, which consisted off chicken, bacon, sweetcorn and BBQ sauce. Could you really ask for a better combination! The pizza was a nine inch square pizza. It looked kind of small when it arrived, but I have to say it was very filling and I was very full by the time I finished. The pizza itself is square to make it stand out, and gives you confidence that you’ve actually been given the correct pizza. The gluten free pizzas are baked on their own square trays to minimise cross contamination risks, and a clean pizza cutter is delivered with your un-sliced pizza again to cut out another risk from the kitchen. The base itself was very nice. It wasn’t very crispy if this is how you like it, but this suited me. The balance between topping and base was spot on and we both really enjoyed the pizza. I remember Pizza Hut being very greasy when I used to be able to eat there, but there was no hint of grease on this pizza at all. Actually my wife always used to complain about the grease, and I would not be surprised if she would prefer this base to the standard one. The staff seemed very keen to help and I have seen this mentioned a few times by other people. There seemed to be genuine interest on what we thought of the pizza, and they were keen to tell us about good feedback they’d received from other customers about it. There seemed to be some genuine interest/excitement from the staff about the new option. They were happy to take us through the allergy list, and I even troubled them to show us the dessert options even though we’d already told them we weren’t having any. Pretty slim pickings in that respect. I would definitely go back for another go, and it is great to have another readily available option when out and about. It was also really nice just to sit in a pizza restaurant and feel a little bit normal for a change. A luxury once taken for granted and now so precious. I’d love to hear about your Pizza Hut experience. Please comment below and let everyone know how you found it. I look forward to hopefully bringing you Prezzo and Domino’s reviews in the near future. Great review! I tried it out last week and haven’t stopped raving about it, so much so that my boyfriend took me on Monday evening to keep me quiet and find out what I’d been fussing about! The staff at the Braintree store were so interested in the gluten free base and seemed so chuffed that they offered it! One was saying how they want to get the kitchen to make them all one to share so they can see what it tastes like – I assured her it tasted just like ‘real’ pizza! I went for BBQ sauce, chicken, red onions, peppers and chillies and absolutely loved it! The base is definitely one of the nicest GF ones I’ve tried, didn’t find it dry or ‘cardboardy’ at all! Really impressed with the seperate boards for serving the GF pizzas and the cutters! I also found it quite filling and even had leftovers for lunch on Tuesday! hi kevin went to pizza hut last week with my two granchildren.first time i had a pizza very nice’said the ice cream was gluten free…two of the sweet toppings [which u put on top of ice cream] is glutenfree but not the small black and orange ones are.so b carefull..the staff we very nice.. Thanks for the comment Donna!